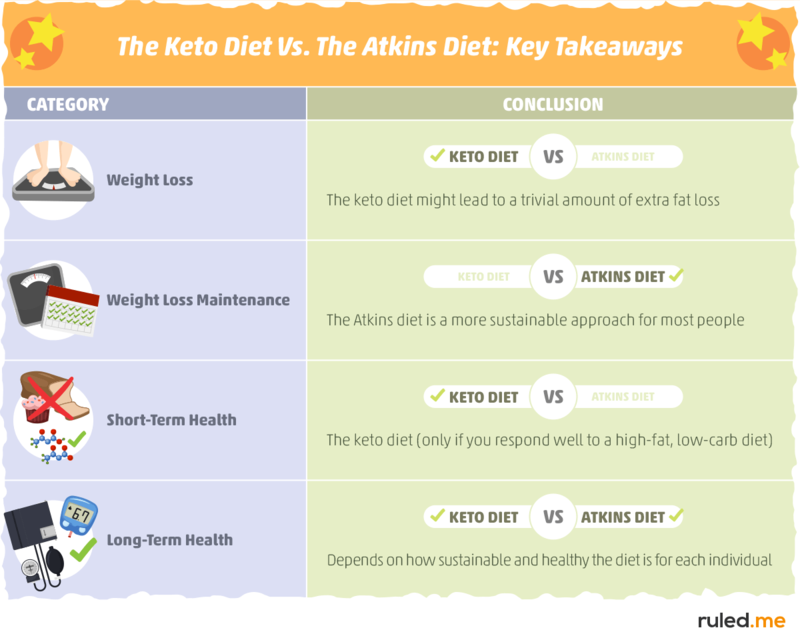 Keto Diet vs. Atkins Diet: What's the Difference? The ketogenic diet and the Atkins diet have both helped thousands of people achieve incredible fat loss results and improve health. However, there is much controversy surrounding which approach is best for weight loss, how healthy they are, and how they work. Both diets focus on restricting carbs to lose fat, but the Atkins diet approaches this from a different angle than the keto diet. The hallmark (and benchmark) of the keto diet is sustaining nutritional ketosis, while the Atkins diet focuses primarily on adjusting net carb intake to stimulate and maintain weight loss throughout multiple phases. Although both approaches have been shown to be effective for weight loss and health improvement, they each have some key differences that make them better for some and worse for others. In this article, we will dissect each diet to help you figure out which one may be a better option for you. Key Takeaways: Is Ketosis Better than Atkins? Putting It All Together: Which Diet Should You Choose? The ketogenic diet was first formulated as a treatment for epilepsy in the 1920s. Its ability to mimic many of the positive aspects of fasting is what made this diet such an effective option for reducing the frequency and severity of seizures. The unique benefit of keto that sets it apart from all other diets is its ability to keep the body in a state of nutritional ketosis. This allows us to experience the many benefits of burning ketones for fuel (which we will learn about throughout this article). Nutritional ketosis is a metabolic state in which your body is consistently using a highly efficient alternative fuel called ketones. To produce ketones and enter ketosis, we must continually trigger a process in the liver called ketogenesis. The healthiest and most efficient way to do this is by limiting carb consumption to between 20-30g of net carbs (i.e., total carbs minus total fiber) and increasing intake of high-fat whole foods. By doing so, we can stimulate ketogenesis to the point that you enter and sustain nutritional ketosis. This is why we call this low carb diet the “ketogenic diet.” When you break it down, it literally translates to a diet that causes the production/generation of (“-genic”) ketones (“keto-”). This provides us with a simple way to decipher the difference between a keto diet and other low carb diets (like the Atkins diet): If your dietary approach does not allow you to maintain nutritional ketosis, then you are technically not on the keto diet. Following this food list will help you get around 70% fats, 25% protein, and 5% carbohydrate, which is the typical macronutrient distribution of a keto diet. The one thing that sets the keto diet apart from every other diet is its focus on restricting carbs to maintain ketosis. If you are in sustained nutritional ketosis as a result of limiting carb intake, then you are on the keto diet. If you are not in ketosis consistently, then you are technically not on the keto diet. Most people will need to keep their net carb intake below 30 grams to achieve this state. Although you can lose weight without being in ketosis, this metabolic state can provide you with unique health benefits and suppress your appetite (resulting in more weight loss). This is a unique advantage that the keto diet has over other dietary approaches, and we will learn more about this after exploring the details of the Atkins diet. Cardiologist and nutritionist Dr. Robert Coleman Atkins started developing this diet in the late 1960s. After years of research, he published his first book, Dr. Atkins’ New Diet Revolution, in 1972. In this book, Atkins explains his findings on low-carb eating along with a practical approach known as the Atkins diet. The book became a big success and kicked off decades of research and debate within the medical community. The induction phase is designed to jumpstart your weight loss by restricting below 20 grams of net carbs per day. This is meant to kick start your fat burning metabolism. This phase is almost identical to a standard keto diet. The only difference is that the Atkins diet does not limit protein intake while the keto diet typically requires keeping protein intake around 25% of calories. The Atkins website says to stay in this phase until you are 15 pounds from your goal weight. Phase 2 is all about balancing your diet and maintaining your weight loss momentum from Phase 1. During this phase, you will start adding more carbs from foods like nuts, seeds, strawberries, blueberries, melon, cottage cheese, yogurt, and more. The goal here is to reintroduce a variety of carbs until you reached the max level you can consume while still losing weight. To do this, net carb content should be increased by 5-gram increments daily. Typically, people find that their net carb limit is between 30 and 80 grams. The Atkins website recommends remaining in this phase until you are 10 pounds away from your goal weight. Make sure to monitor your weight loss as this will help you determine when it’s time to move on to the next phase. The focus of phase 3 is to find a carb limit that will allow you to maintain your results. The Atkins diet does this by introducing some healthy high-carb foods like fruits, starchy vegetables, and whole grains. Increasing net carb intake by no more than 10 grams per week is recommended. Because of this significant rise in carb intake, it is crucial that you monitor your weight loss during this phase. If you notice staling, it’s time to cut back a bit on the carbs. If you are still losing weight, keep increasing carb intake until you hit a stall or reach your goal weight. This phase will last only until you’ve lost your target amount of weight and kept it off for a month. By the end of the phase, people typically are eating between 80 and 100 grams of net carbs daily. This is more of a transition toward a healthy, sustainable lifestyle than a phase. In general, the foods you eat in this phase are the same ones you’ve eaten in previous phases. You can also experiment with adding some of your favorite high carb foods as long as you remain near your goal weight. The goal of this phase is to find a carb intake level that your body can handle without gaining weight. Up to 100 grams of net carbs per day is realistic for most people. You are practically following a standard keto diet until you are within 15 pounds of your goal weight. You will then increase net carb intake little by little until you are following a low carb diet that allows you to maintain weight loss. If you hit a plateau or start gaining weight, simply dial your net carb intake down until you can reach and maintain your goal weight. Learning the fine details behind each phase can help you stick to the diet, but these three points are the underlying principles governing the Atkins diet as a whole. To help us figure out which diet may better for you, let’s begin by defining the major characteristics that set them apart from each other. Important Note: There are many different variations of the keto diet and the Atkins diet. For the purposes of this article, we will be contrasting a standard keto diet with a standard Atkins diet (also known as the Atkins 20). If you need a quick refresher on what I mean by “standard keto diet” and “standard Atkins diet,” please use the above chart and previous sections for reference.We can use this chart to help us determine what advantages each diet may have over the other in different contexts. Let’s start by exploring the research regarding the primary reason why most people follow these diets: weight loss. When it comes to weight loss, there are no studies that compare the Atkins diet and the keto diet directly. However, we can look at the diet literature as a whole to help us come to a conclusion. The first step is to figure out if eating fewer carbs results in a reliable increase in weight loss. If this is true, then the keto diet would hypothetically allow us to burn off more fat because it keeps carb consumption lower for longer. The diet and weight loss literature, however, points to a different relationship regarding weight loss: Decreasing calorie intake, not carb intake, is the critical factor that stimulates fat loss. In other words, It doesn’t matter if you are on a low-fat, low-carb, or zero-carb diet, you will lose weight as long as you are consuming fewer calories than your body needs to maintain its current weight. This consistent finding opens up a world of possibilities for weight loss because you can lose weight on virtually any diet as long as you maintain a calorie deficit. It’s that simple. However, an important question still remains: How does the weight loss literature apply to the incredible results that many people get from following low carb diets like the keto diet and the Atkins diet? The answer has little to do with carbs and more to do with how these diets naturally decrease your calorie consumption. We eat more highly satiating foods. We avoid most of the foods that cause us to overeat. These changes naturally lead to a reduction in calorie intake which can help us lose weight. This explains why meta-analyses of studies on keto diets and non-keto, low-carb diets (like the Atkins diet) have found that both lead to similar amounts of weight loss after a year. If we apply the available data to the keto vs. Atkins weight loss debate, the most reasonable hypothesis is that they both can help us achieve similar amounts of weight loss. That being said, the keto diet might have a slight weight loss advantage because ketones have been found to suppress appetite which can lead to a reduction in calorie intake. Since the keto diet aims to keep you in ketosis and the Atkins diet does not, this may give keto a slight edge in weight loss. How much of an edge exactly? It is hard to tell because there is no research data that can help us answer the question directly. However, the current literature on low-carb and keto diets indicates that being in ketosis may only provide a trivial weight loss advantage. On average, the data suggests that the keto diet and the Atkins diet will yield similar amounts of weight loss. This means that to figure out which diet is best for each individual, we must look at it from a long-term perspective. Unfortunately, the results you get now don’t matter if you cannot maintain them. The key to keeping the weight off is to stop relying on willpower and restriction. Long lasting results are achieved by (1) making healthy lifestyle changes a habit and (2) changing your environment to support those changes in any way you can. Does your current diet help you improve your health and lose weight at a healthy pace (1 to 2 pounds per week)? Can you convert this diet into a long-term lifestyle that helps you stay healthy and maintain your weight loss? Can you adjust your lifestyle, habits, and food environment to help you lose weight and keep it off without having to always rely on willpower, discipline, and social isolation? To help you decide if keto, Atkins, or any other diet may be a better option for you, refresh your understanding of each diet, and ask yourself the above questions. If you answer a clear and resounding “no” to any one of these three questions, then you should shift to a different approach. If you are not sure, then give the diet a try for 2-3 months, track your health and wellbeing throughout the process, and ask yourself these questions again. 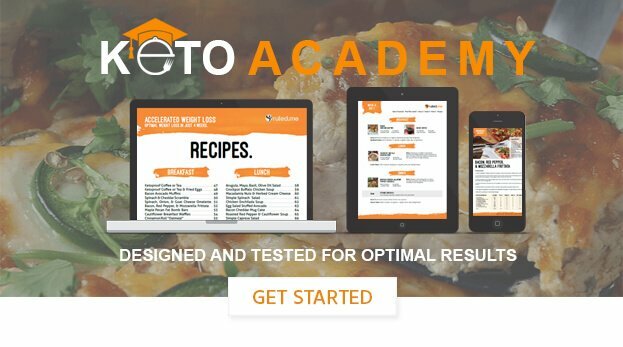 This experimental process will help you figure out if the Atkins diet, the keto diet, or another dietary approach is better suited for you, your health, and your lifestyle. If you find that low carb diets are a more sustainable option for you, then the Atkins diet seems like a better choice for weight loss maintenance. The Atkins 20 has two phases that are specifically designed to help you make your diet and weight loss results much easier to maintain without having to rigidly restrict carbs for the rest of your life. Although many people have no problem sticking to the standard keto diet for the long-term, the Atkins diet (or transitioning from a keto diet to a non-keto low-carb diet) is a more sustainable approach for most people. Weight loss is worthless if you worsen your health in the process. Unfortunately, it will be difficult to directly compare the health effects of each diet because the research on the Atkins diet is lacking. However, if we use our simplified description of the Atkins diet as being a short-term keto diet (phase 1) followed by a long-term non-keto low carb diet (phases 2-4), we can better understand and decipher what these diets can do to our health and what may be a better option for you. Let’s start by summarizing the current data on low-carb diets (which includes the keto diet and Atkins diet) and how they affect different health conditions and biomarkers of health. Some of the most well-studied and well-known biomarkers are triglycerides, cholesterol, blood sugar, A1c, and blood pressure, and all of them have been found to improve significantly as a result of cutting the carbs (for most people). Some evidence suggests that a keto diet may be more effective than an Atkins diet at helping patients with diabetes, high blood sugar levels, high blood pressure, fatty liver disease, and polycystic ovary syndrome. 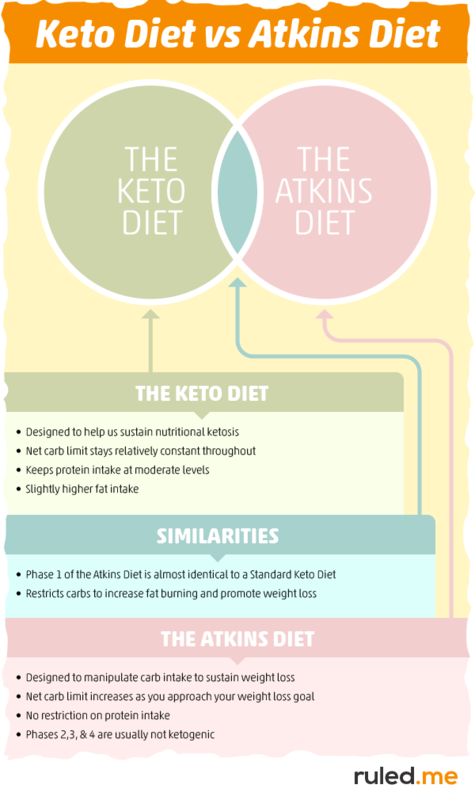 Since the first phase of the Atkins diet restricts net carbs lower than the keto diet, it will usually result in nutritional ketosis as well. This means that the Atkins induction phase will provide you with the same benefits as the keto diet (i.e., nutritional ketosis and carb restriction) until you start adding carbs back in. Also worth noting is that a great deal of research has been done on the modified Atkins diet for epilepsy, yielding almost identical results to the keto diet. This is because the modified Atkins diet restricts carb lower than standard keto and does not transition to higher carb phases. Overall, the keto diet, phase one of the Atkins diet, and the modified Atkins diet may be more helpful and healthier than a less-restrictive low carb diet if you have one of the conditions listed above. With that being said, carb consumption does play an important role in our health (mainly by helping with hormonal regulation and replacing excess calories from fat). Because of this, some people may experience a worsening of their health as a result of following a carb restricted diet. This is why it is crucial to monitor your health regularly after making any significant dietary change. The person is “healthy” while following the diet, as indicated by relevant lab tests and their overall sense of vitality and well-being. The person can maintain their diet without it diminishing their quality of life. These three criteria serve as helpful indicators for how safe and healthy any diet is for you. If all three are met, keep doing what you are doing (unless, of course, your doctor strongly advises against it). Conversely, if the Atkins diet or the keto diet isn’t improving your overall health, then it may be best to increase your carb consumption until your relevant biomarkers improve (cholesterol levels, thyroid hormone levels, etc.). However, this doesn’t mean you should just start eating whatever processed food is available because this will make your health even worse. Instead, it is best to follow a less-restrictive, whole-food-based low-carb diet like the Paleo diet, a low-to-moderate carb Mediterranean diet, or a higher-carb Atkins diet. After a month or two of implementing your new approach, it may be best to get another blood test to see how your biomarkers are doing. Regardless of what diet you try, it is important to keep in mind that the best diet for long-term health is different for each individual. The only dietary change that most people will benefit from is replacing high-carb processed foods and processed meats with more plant-based whole foods. Once the diet trends in the direction of more whole foods and less processed foods, health and body composition usually begin to improve. Whether or not you should get more strict with carb intake by following the keto diet or Atkins diet depends on what happens to your health as you decrease carbs and increase fat and protein. If you would like to see more practical information on how to formulate a healthy diet, I recommend checking out this article. Although it focuses primarily on the keto diet, the principles that you will find throughout the article will help you create a healthier diet regardless of what low-carb approach you choose. Key Takeaways: Is Nutritional Ketosis Better Than the Atkins Diet? This is because the deciphering factor between the two diets is that one is designed to keep you in ketosis (the keto diet) while the other restricts carbs to increase weight loss without the goal of staying in ketosis. Weight Loss Results — The keto diet may have a slight advantage because it keeps you in appetite suppressing levels of ketosis. However, the difference is probably so small that you are better off formulating a diet that you can stick to for the long-term. Weight Loss Maintenance — the Atkins diet may be a better long-term diet strategy because it slowly incorporates higher carb foods and is less restrictive. It also provides you with strategies that you can use to help you keep the weight off. Short-Term Health Effects — The keto diet provides you with the benefits of restricting carbs and burning ketones at the same time, making it a better option for people with specific health conditions and for those who respond well to high-fat, low-carb diets. The modified Atkins diet and phase 1 of the Atkins diet can provide the same benefits as well. Long-Term Health Effects — It depends on how you respond to the diet. Some people optimize their health with a keto diet or Atkins diet while others require a higher carb approach. This is why it is crucial to monitor your health after making significant dietary changes. Never assume you have better health just because someone else got incredible results from following the same diet. Putting It All Together — What Diet Should You Choose? Keto or Atkins? Now that you know the ins and outs of each diet, which one should you chose? It depends. The Atkins diet and keto diet both have the potential to help you lose weight and improve health, but whether or not it will work for you depends on various lifestyle and health factors. Does this diet help me improve my health and lose weight at a healthy pace? Can I convert this diet into a long-term lifestyle that helps me stay healthy and maintain my weight loss? Can I adjust my lifestyle, habits, and food environment to help me lose weight and keep it off without having to always rely on willpower, discipline, and social isolation? Your diet is helping you achieve a healthy weight and body composition. You are healthy while following the diet, as indicated by relevant lab tests and your overall sense of vitality and well-being. You can maintain your dietary approach and your results without diminishing your quality of life and mental health. If you are not sure how either diet will affect you, then consider doing a test run for 2-3 months. Monitor your health, your wellbeing, and your results during this trial. You may need to transition to a less-restrictive low carb diet or moderate carb diet that focuses on whole foods if the keto diet or Atkins diet doesn’t meet the above criteria. The Paleo diet or the Mediterranean diet, for example, may be a healthier and more sustainable option for you. Regardless of what diet you choose, always keep in mind that you will never find your ideal diet. It is not waiting for you in a book or through an online success story. The best diet for you — a diet that is healthy, sustainable, and helps you get the results you want — can only be formulated with the help of careful experimentation, self-awareness, and self-compassion. If you’d like to start your journey by giving keto a try, I recommend reading through our 3-step guide to following a keto diet first.